Transmission Fluid Change or Flush - What Is The Difference? Transmission Fluid Change or Flush – What Is The Difference? One of the best ways to keep your parts running longer is to do regular maintenance. By doing this, you take smaller, more inexpensive steps that help preserve the life of critical parts like your transmission, that way you do not incur large expenses down the road. One of the best ways to accomplish this is by changing or flushing your transmission fluid regularly. There are different services you can buy to accomplish this. One method is a transmission fluid change. This is where you would take your car to a mechanic, who would replace your fluid and filter in your pan. 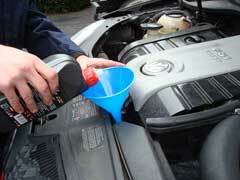 Doing a transmission fluid change annually is important because it can keep your fluid clean. In turn, this will prolong the life of your transmission by having it run at peak condition. Meanwhile, you could also do a transmission flush. This is where the mechanic uses a transmission flush machine to do a fluid transfer. The transmission flush cost depends on the make and model of your vehicle. Typically, these run in the $100-$200 range, but could be more if you have a foreign car. If costs are an issue, there’s always the option of a DIY transmission flush, as it will save you money. Now it’s important to note that a flush can be tricky, therefore, someone with extensive experience should do it. The reason for this is if the flush is too powerful, it allows sludge to break free. In turn, it can attach to valves, which could cause significant damage to your components. If you do have the experience and know you can do the flush well, be sure to buy reputable brands like Allison transmission fluid to help you complete the job. When comparing the two services, a transmission fluid change is good in that you receive clean fluid and filter, which can help keep your component running more smoothly. However, a flush is more beneficial than a transmission fluid change, as it removes buildup from the system, which can reduce the transmission’s effectiveness over time. Ultimately, by either doing a flush or a transmission fluid change, you are taking steps to preserve the life of your parts. When you consider that repairing a damaged transmission can costs thousands of dollars, small steps like these are great preventive measures that can help increase the effectiveness and longevity of your part.